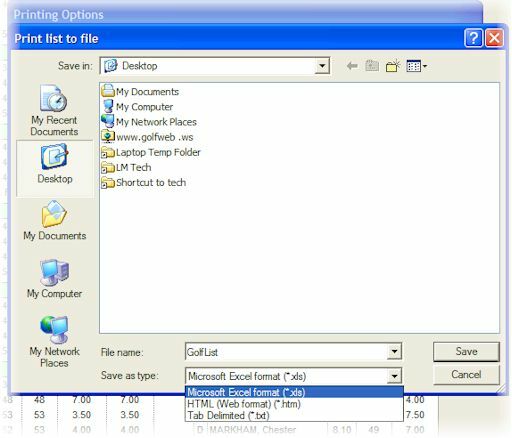 Views and Reports can be exported to Html (web format), Excel (Microsoft Excel format), or Text (TAB delimited) file, which can be imported into most web pages, browsers, spreadsheet applications and word processing programs. Pull up the View or Report you would like to export. Click on the in a View (top of display) or Report (bottom left), or select Print or Export View from the League menu in a View or Save (Export) As... from the File menu in a Report (if Save (Export) As..., skip to Item 5 below). 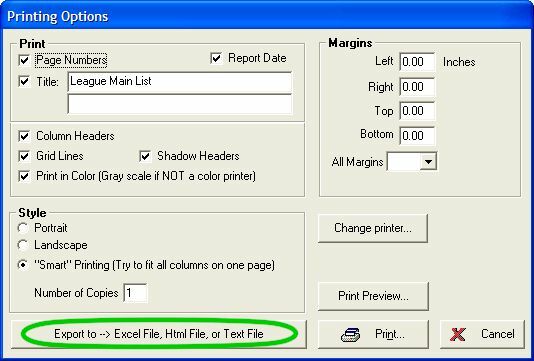 From the Printing Options window, click on Export to --> Excel File, Html File, or Text File. 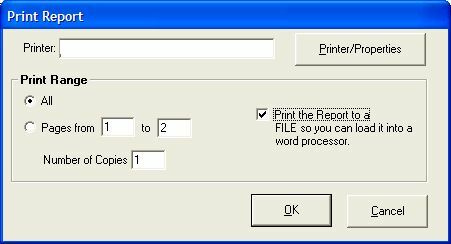 If you are in an (Old) Text Style Reports, check the “Print to file” option. From the Print list to file window, select where to "Save in:", type in a "File name:" and select "Save as type:" and then click Save.